I tend to go through phases in my food cravings. Lately the two big ones have been gyros (several more write-ups on the way soon) and fish. 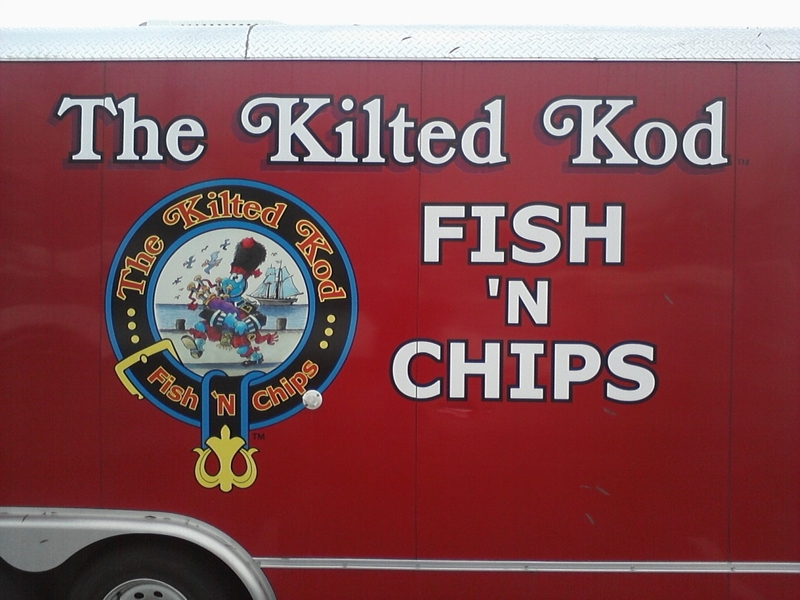 Luckily, there's a place in town where I can indulge not only a craving for fish but also my love of street food: The Kilted Kod. 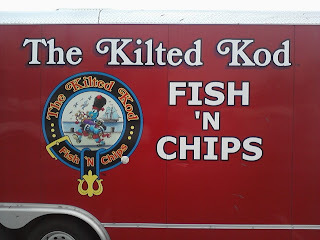 The Kilted Kod is an interesting enterprise. Like most food trucks (or in this case, a food trailer hitched to a truck) they have a pretty consistent location, in their case the parking lot of MacLife on Overland Road just East of Maple Grove. Unlike most of the other trucks, however, they're very focused. First of all, they're generally only open on Fridays, from Noon until they run out of food. It used to be Fridays and Saturdays, but as often as not they just didn't have enough (or any) food left to open with on Saturday. Another thing that sets them apart is their extremely small menu. Seriously, they have fish n' chips and chicken n' chips, in adult or child portions. Period. The beverage selection is a little more diverse, consisting of coffee, cocoa, tea, canned sodas, and bottled water. Oh, and they only take cash. Some might find this limiting, but I admire that type of dedication. I've never been there when there wasn't a fairly constant stream of customers, most of them chatting away with the proprietors while their food is prepared. In fact that's why the above picture doesn't show much, because I couldn't find an angle that wouldn't have captured at least two patrons. The people inside the bright red trailer are very friendly, exuding the kind of genuine bonhomie that endears customers to the point where they'll cheerily stand in a parking lot in wind and snow, making small talk when they could just as easily go sit in their cars. I mean check out their website, where you will find nuggets of family info and galleries of smiling patrons, or their Facebook page where you'll find more of the same. And it will take several minutes for your order to come up, because it's fresh. Well, the chips I'm not so sure about, they could easily be the frozen type, but I've personally seen them pull out fish after I've ordered and batter it by hand. I simply must learn to frame my pictures better for perspective because, while it might not necessarily look it, that is a serious heap of food. I've heard/read more than one comment to the effect that the fish doesn't have a lot of flavor. Now I've never been to the UK so I can't speak to the authenticity of the preparation, but I personally don't want strong-flavored fish, primarily because if fish tastes fishy it's usually old or otherwise bad quality. This stuff is pleasant and mild, with just enough batter to contain the heat and keep the fish moist and tender, and any time you can eat fried food and say things like that afterward is good. Besides, if you piled a bunch of seasoning into the batter it could easily become too much were you also to take advantage of the available malt vinegar, tartar sauce, or both (as I do). Back to the portions: I've never been able to finish one. Once again I found myself tearing through the fish as fast as I could without doing serious injury to my mouth or lips because it's simply better when it's fresh and piping hot, eating a few fries here and there to mix things up. Once the fish was gone, I found myself staring at a still respectable pile of fries. I ate a few more before realizing that it wasn't necessary, I was perfectly happy and satisfied, and stuffing myself wasn't going to help anything. Isn't that the ideal way to feel after a meal? By the way, for those of you who aren't keen on fish, let me express one thing: their chicken is even better.